If you’ve been teaching for a while, you have had Johnny in your class. 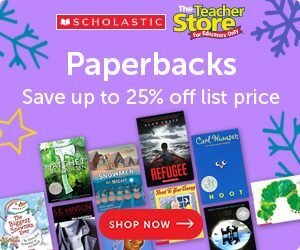 If you’re a new or soon-to-be teacher, you will have Johnny in your class. It’s guaranteed. You know Johnny. He’s the student who just doesn’t care. He’s the one who will take every opportunity to make your day miserable. He talks too much. He talks back to you. He distracts the other students in your class. When you give him a warning, he doesn’t care. You know Johnny. He’s the student you wish was absent, so you can go through an entire day without getting frustrated, but he’s never ever absent. He gets the perfect attendance award every year. You know Johnny. All you want is to for Johnny to change his behavior. Life would be good if Johnny would just change his behavior. So the question is: How do you change Johnny’s behavior? 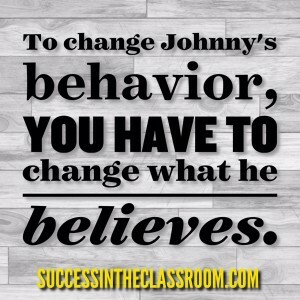 To change Johnny’s behavior, you have to change what he believes. There is a lot of research that demonstrates how our behavior is determined by our beliefs. This not only goes for kids, but also for adults. 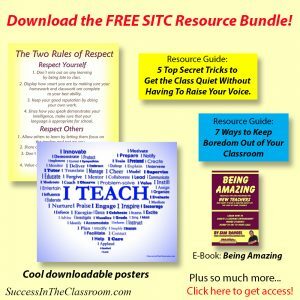 As an assistant principal, I’m constantly trying to change adult behaviors, and I’m finding that before I can do that, I need to work on changing some basic core beliefs. 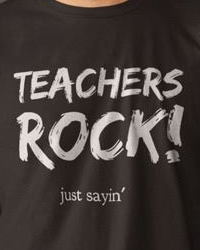 That, however, is for another post – maybe on my administrator site – SchoolAdministrationMastery.com. In this post, however, I want to focus on how you can change what Johnny believes. Once you can do that, his behavior will change. So what does Johnny believe? Johnny believes that education is not as important as we tell him it is. Johnny believes that what you’re teaching is not valuable. Johnny believes that what his friends think of him is better than what you think of him. Johnny believes that homework is a waste of time. Johnny believes that what happens today is more important than what will happen in the future. Now what really is scary is that there might be more serious beliefs that are causing Johnny to make poor choices. Johnny believes that he is a bad kid. Johnny believes that nobody cares about him. Johnny believes that he doesn’t have a future. Johnny believes that he can’t learn. Johnny believes that you hate him. Once you understand what Johnny believes, it’s easier to understand why he behaves like he does. This may be absolutely true, but it really doesn’t matter what the truth is. The only thing that matters is what Johnny believes. What Johnny believes will be what determines his behavior. So how do we change what Johnny believes? Now that’s a tough question to answer. His beliefs have been created over years, and you can’t just change a person’s beliefs in a class period or a month or even a year. I do know where to start, however. 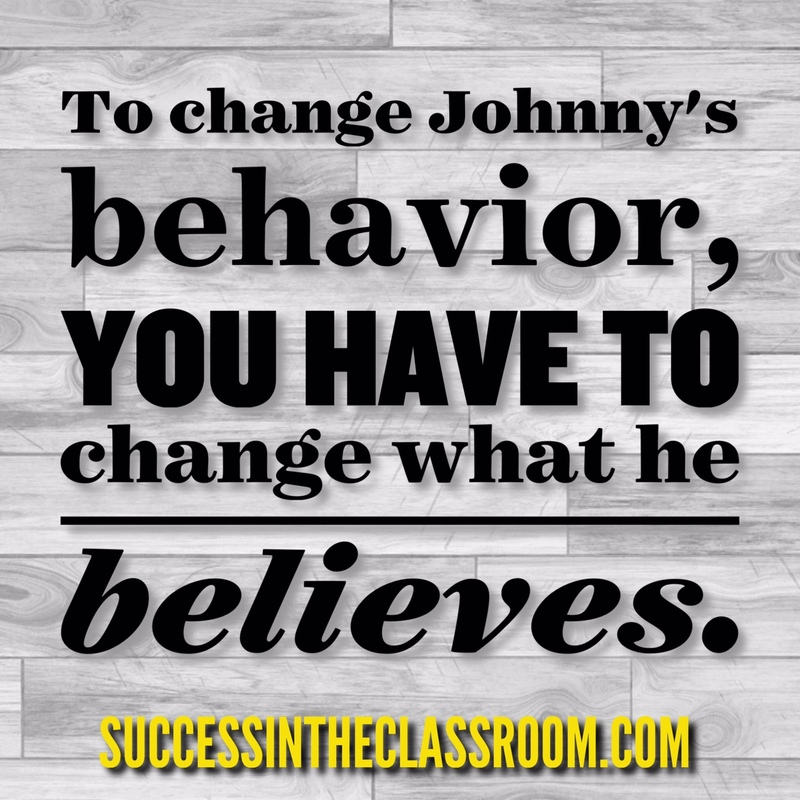 Your first step to change Johnny’s behavior, is to change his belief about you. He has to believe that you believe in him. 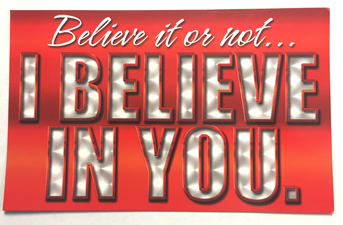 Johnny has to believe that you believe in him. If he is misbehaving in your class, then you have to assume that he doesn’t believe that you believe in him. Even if you know within your heart that you believe in him, you have to make him believe it. How do your interactions with him send that message? Think about the last time you interacted with Johnny. What message did you send? Was it one that helped change his beliefs or was it a message that confirmed what he believed? We want Johnny to change. We want his behavior to change. It begins with us. It begins with you. What will you do to help change what Johnny’s beliefs? The answer is easy. The implementation will be more work, but it will be rewarding work. It will be transformative work. It will be life-changing work – for Johnny and for you. I hope you found this post helpful. If you did, please share it on Facebook or Twitter. P.S. 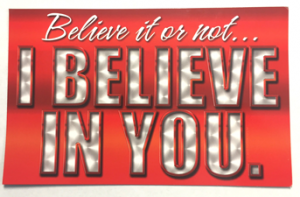 I created a whiteboard magnet that you can put up to remind your Johnny that you believe in him. Check it out on Amazon.